Do you have knee arthritis? Do you want to prevent or delay having a knee replacement? Or have you decided to have a knee replacement and you want to optimize recovery afterwards? 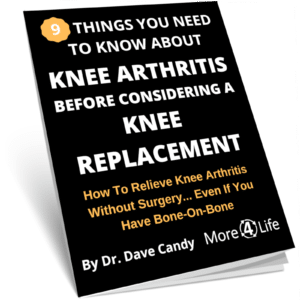 This FREE guide shows you how decide if you need knee replacement surgery, alternatives to prevent or delay surgery, what to do BEFORE surgery to optimize your outcome afterwards, AND what you can do if you've already had surgery! 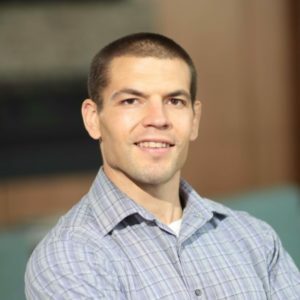 Hi, I'm Dr. Dave Candy and welcome to Movement 4 Life Physical Therapy! Or have you decided to have a knee replacement and want to optimize recovery afterwards? Its no fun to have to skip activities with family and friends or power through them with a smile while inside you are suffering. I'd love to show you how busy people with knee arthritis can prevent, delay, or optimize outcome after total knee replacement so they can stay active, healthy, and relatively pain-free well into old age. to help you take control of your knee arthritis symptoms and get back to the happy, fulfilling life you deserve. If you've already had a knee replacement, don't worry...there's information in there for you too! Just enter your first name, your email address and click the “Yes! I want the free e-book” button below and you'll instantly receive the free e-book by email. You'll receive valuable information that shows you how to prevent, delay, or optimize recovery after knee replacement surgery. I work with busy people just like you nearly every day to help them find relief from knee arthritis and other types of chronic pain. What I can tell you is that pain medications, chiropractic treatments, massage, injections, OR EVEN TOTAL KNEE REPLACEMENT SURGERY may provide some relief, but on their own, they are not likely to provide a long-term solution. Why? Because they only treat the symptoms of your pain without addressing the root causes (which may be more just than the arthritic joint itself)! I know so many people who have just accepted that knee arthritis pain is now a normal part of their lives. This does NOT have to be you! The FREE e-book will explain why you should have hope that you can live happy, fulfilling life without being plagued by knee pain. Inside you’ll find information about knee arthritis, information on how to decide if you need a knee replacement, alternatives to knee replacement, and strategies you can use to prevent, delay, or optimize recovery after knee replacement surgery. If knee arthritis pain is keeping you from enjoying life to its fullest, then you need to take a few minutes to read this e-book. This e-book is NOT for you if you're content to continue living with your knee pain, relying on medication to control the pain, or rolling the dice with knee replacement surgery and hoping that it helps your pain (which it doesn't always). What would your life look like in a few months if you could enjoy all the activities you love without being limited by your knee pain? So go ahead... enter your first name, your email address and click “Yes! I want the free e-book” button to instantly receive the e-book by email. There’s no catch…I’m doing this because I believe your healthcare decisions are important and having the right information will empower you to make the best choice about the next steps in your journey to a happier, healthier life free from the plagues of knee arthritis pain! All you have to do is enter your information and I’ll send it to you immediately. Are you ready to take the next step toward freedom from knee arthritis pain? Are you ready to start addressing your knee pain URGENTLY?